Note: transactions via Bank accounts can be carried out in the following currencies: AED, AUD, BGN, BYN, CAD, CHF, CNY, CZK, DKK, EUR, GBP, HKD, HRK, HUF, ILS, ISK, JPY, MXN, NOK, NZD, PLN, RON, RSD, RUB, SAR, SEK, SGD, THB, TRY, USD, ZAR. * Non-resident is a legal person whose residence is registered outside the Republic of Lithuania. ****** ABF applies only to legal person which the Bank informs individually 30 calendar days in advance. ABF is calculated at the end of each calendar day where the sum of balances in all bank accounts of one legal entity exceeds the pre-set ceiling in the respective currency multiplying by the rate indicated in the table absolute value (i.e. module). No ABF applies when the central bank interest rate in the respective currency becomes positive or zero. ABF for the previous calendar month is debited from the account by the 10th day of the following calendar month in accordance with the procedure laid down in the bank account agreement. 2.1. Maintenance of Bank account (including opening and (except non-residents), closing). 1 Business Service Plan can be ordered only by legal entities which were established no earlier than 12 months ago, provided that no agreement on the application of the Business Basket rates has been concluded with the Client. The terms and conditions of the Service Plan will be applied to the Client for 366 calendar days from the date when the Service Plan‘s rates took effect for the Client. On expiry of the said term, standard rates of the Bank‘s services and operations will apply to the Client. 2 The fee is payable for each calendar month and is debited within the period from the 1st to 15th date of next calendar month for the past month. The fee is paid irrespective of whether the services included in the Service Plan are used or not. The monthly fee for the Service Plan for the first month in which the Service Plan was ordered by the Client and for the last month in which the Client terminates the Service Plan is calculated in proportion to the number of days when the terms of the Service Plan were applicable to the Client but the amount payable will be not smaller than one half of the Service Plan‘s monthly fee. In the event of termination of the Service Plan by the Client within the period of 31 calendar days from the date of its ordering, the Client will pay the full Service Plan‘s monthly fee for the month in which it was terminated. 3 The Service Plan comprises only the contactless Business debit card MasterCard and in such number as indicated according to the chosen Service Plan. The Bank itself will select and assign to the Service Plan a certain debit card(s) issued in the name of the client. The client’s debit card assigned to the Service Plan will not be entitled to any other discounts, unless otherwise specified by the Bank. 4 If the client opts for one of the following Service Plans – Business, Business 10, Business 20, Business 50 or Business 100 – only one PIN generator is provided to the client free of charge and only for the first time the client chooses one of the listed Service Plans. The terms used in Prices and Rates have the same meaning as the terms used in Swedbank’s Complete Price List of Services and Operations. Services not included in a Service Plan are charged according Swedbank, AB rates standard rates for services and operations. 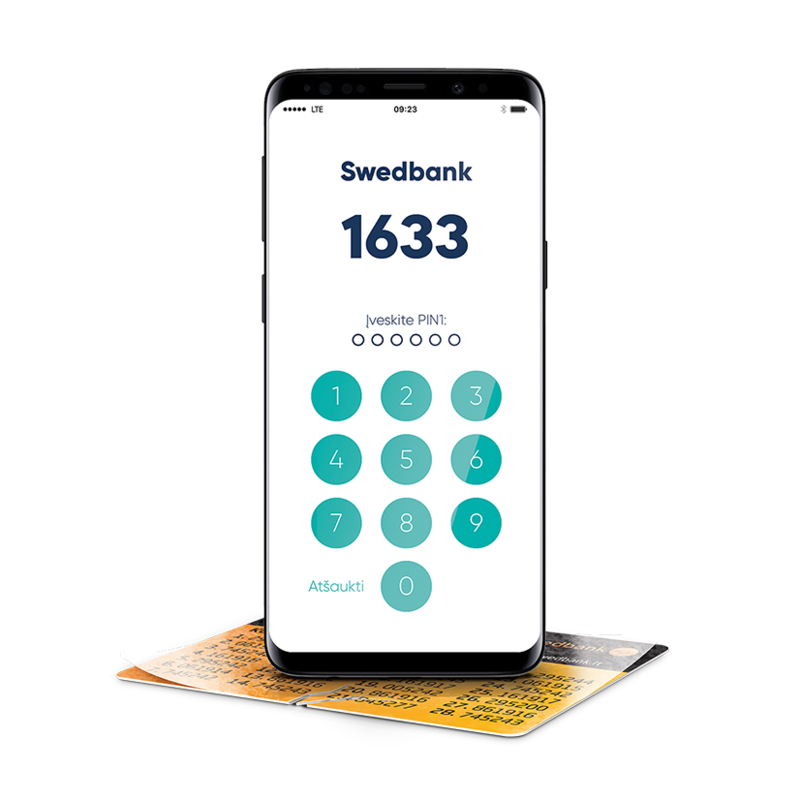 If the number of credit transfers exceeds the number indicated in a Service Plan, such credit transfers are charged with Swedbank’s standard rates for services and operations. If the client wishes to choose a Service Plan or to change it, the client needs to submit an application to the Bank. Once the client chooses one of the Service Plans, from the date the Service Plan fees becomes effective the client is no longer entitled to the rates of Swedbank internet bank for business Price Package 1 and Price Package 2. When the client opts out of the chosen Service Plan, the client is charged with Swedbank’s standard rates for services and operations. The client can choose only one Service Plan at a time: Business, Business 10, Business 20, Business 50 or Business 100, and in addition Business Plus or just Business Plus. If the client decides to change from the chosen Service Plan – Business, Business 10, Business 20, Business 50 or Business 100 – to another Service Plan offered by the Bank, except Business Plus, the client is supposed to have opted out of the chosen Service Plan. No other discounts or individual rates are supposed to be applied to a fee for services included in a Service Plan. If the client, before choosing a Service Plan, was entitled to discounts and individual rates, these discounts and individual rates will be terminated within two business days of the Bank and the rates of the chosen Service Plan will become effective. Service Plans are not meant for credit and payment institutions as well as electronic money providers. If the Bank finds out that the client is operating as a credit and payment institution or electronic money provider, the Bank is authorised to terminate the rates of the Service Plan for such client. Other Transactions / operations conducted via the Swedbank Internet Banking for Business Customers are charged according to the Bank rates. *Valid for agreements, concluded until 13th of March 2017. Applies to contracts concluded / changed from 25.03.2019. 1 Fee is stated without Value Added Tax (VAT). Fee is subject for VAT the amount of which is determined in accordance with the applicable tax laws of the Republic of Lithuania. 2 Terminal urgent installation term - next working day. Note: the fee is applicable to money transfers to each separate beneficiary indicated in the Mass payment order. Hour shall mean an hour until which the payment order delivered on the Bank's business day is considered as received (the countdown of the term of executing such payment order starts) on the same day and shall be executed within the number of the Bank's business days specified in the 'Day' column, counting as of the day of delivery of the payment order. Payment order delivered after the specified hour on the Bank's business day or on the day that is not the Bank's business day shall be considered as received (the countdown of the term of executing such payment order starts) on the next Bank's business day and shall be executed within the number of the Bank's business days specified in the 'Day' column, counting as of such next Bank's business day (for example, should it be specified 14:00 in the 'Hour' column and T0 Day in the 'Day' column, a payment order delivered until 14:00 on the Bank's business day shall be executed on the day of delivery of the order, while a payment order delivered after 14:00 or on a day that is not Bank's business day shall be executed on the next Bank's business day). Should nothing be specified in the 'Hour' column, payment order delivered at any time on the Bank's business day shall be executed within the number of the Bank's business days specified in the 'Day' column, counting as of the day of delivery of the payment order. Day shall mean a number of the Bank's business days within which a payment order shall be executed. Countdown of the said term shall be started on the day of the receipt of a payment order, taking into account whether the payment order is delivered on the Bank's business day and/or until the set hour on the Bank's business day (see 'Hour' explanations provided hereinabove). For example, T0 - the payment order shall be executed on the same Bank's business day if delivered until time specified in the 'Hour' column. - Other credit transfers SEPA – on a day when "Swedbank", AB intermediate bank and beneficiary's bank performs transactions under the respective credit transfers (credit transfers). "Swedbank", AB, performs such transactions on days that are neither Saturday, nor Sunday, nor other day-off or holiday defined by the legal acts of the Republic of Lithuania. Payee's bank account must be indicated in IBAN format, and the payment type is designated SHA. **** In case of credit transfer SEPA you (as a Payer) select the OUR transfer, Bank may refuse to carry out such credit transfer on its own discretion (the payment order shall be considered not received) or proceed with the credit transfer after changing it to the SHA transfer. OUR. OUR type credit transfer means that when the funds are transferred to the Payee, the Payer (you) undertakes to pay all charges applicable by Swedbank, AB (hereinafter referred to as the Bank) and other banks' fees established for this type of credit transfer. Where your payment of such a charge to the Bank for effecting the payment order does not fully cover the charges stipulated by your Correspondent bank and the Payee's bank for effecting the payment order in question, you are expected to additionally cover the difference of the charges set by the Correspondent and Payee's banks. SHA type credit transfer means that the Payer (you) covers the credit transfer-related fees charged by Swedbank, AB; fees of the other banks are to be covered by the Payee (meaning that the Payee may receive not a full amount , if agreed accordingly with his payment service provider). Hour shall mean an hour until which the payment order delivered on the Bank's business day is considered as received (the countdown of the term of executing such payment order starts) on the same day and shall be executed within the number of the Bank's business days specified in the 'Day' column, counting as of the day of delivery of the payment order. Payment order delivered after the specified hour on the Bank's business day or on the day that is not the Bank's business day shall be considered as received (the countdown of the term of executing such order starts) on the next Bank's business day and shall be executed within the number of the Bank's business days specified in the 'Day' column, counting as of such next Bank's business day (for example, should it be specified 14:00 in the 'Hour' column and T0 Day in the 'Day' column, a payment order delivered until 14:00 on the Bank's business day shall be executed on the day of delivery of the order, while a payment order delivered after 14:00 or on a day that is not Bank's business day shall be executed on the next Bank's business day). Should nothing be specified in the 'Hour' column, payment order delivered at any time on the Bank's business day shall be executed within the number of the Bank's business days specified in the 'Day' column, counting as of the day of delivery of the payment order. - Other credit transfers non SEPA – on a day when "Swedbank", AB intermediate bank and beneficiary's bank performs transactions under the respective credit transfers. "Swedbank", AB, performs such transactions on days that are neither Saturday, nor Sunday, nor other day-off or holiday defined by the legal acts of the Republic of Lithuania. ** OUR credit transfers non SEPA shall be available only in certain cases when credit transfer non SEPA is executed to the other state which is a non EU Member State, Iceland, Liechtenstein, Monaco, Norway, San Marino or Switzerland. If the credit transfer non SEPA is made in any currency to EU Member State, Iceland, Liechtenstein, Monaco, Norway, San Marino or Switzerland and you (as a Payer) select the OUR transfer, Bank may refuse to carry out such credit transfer on its own discretion (the payment order shall be considered not received) or proceed with the credit transfer after changing it to the SHA credit transfer. OUR. OUR credit transfer means that when the funds are transferred to the Payee, the Payer (you) undertakes to pay all charges applicable by Swedbank, AB (hereinafter referred to as the Bank) and other banks' fees established for this type of credit transfers. Where your payment of such a charge to the Bank for effecting the payment order does not fully cover the charges stipulated by your Correspondent bank and the Payee's bank for effecting the payment order in question, you are expected to additionally cover the difference of the charges set by the Correspondent and Payee's banks. Note: if a credit transfer transfer is denominated in USD, other banks' fees can be additionally debited from the Payee's bank account. SHA. This type credit transfer means that the Payer (you) covers the transfer-related fees charged by Swedbank, AB; fees of the other banks are to be covered by the Payee (meaning that the Payee may receive not a full amount, if agreed accordingly with his payment service provider). A fee for the cancellation of an advance order of cash or because of a post- due taking-out of cash Note: the customer is supposed to order cash against a written confirmation. In branches, sizes of sums to be ordered and periods thereof must be set by the Bank. Note: a) from 6th of December 2018, cash purchase and/or selling operations in Bank are available only for the natural and legal persons who have established contractual relations with the Bank regarding the use of other financial services. b) when a customer buys or sells in cash the amount exceeding EUR 2 500 or its equivalent in other currency, the individually set currency exchange rate more favourable than the standard currency exchange rate announced by the Bank may be applied to the customer. *The fee does not apply for natural person when the payment order in euro to transfer deposited cash to one’s own account in another bank or to another customer’s account in any other bank is presented at once. **The fee does not apply when the sum does not exceed EUR 5. The fee does not apply for natural person when the payment order to transfer deposited cash to one’s own account in another bank or to another customer’s account in any other bank is presented at once. Loan (investment loan, working capital loan, overdraft (credit on bank account), credit line, guarantee limit, and other loans for corporate customers, except loans mentioned below as well as loans subject to separate fees approved). 1. Final charge on a case-by-case basis is determined by a competent loan committee or persons having respective individual expertise. 2. These fees also apply to granting loans to natural persons, if such loans are granted for business financing purposes. * Extra fee shall be charged for non-standard agreements. ** If the escrow account agreement is signed, the fees applicable to documentary payments and guarantees under the clause "Escrow Accounts" will be decreased by this fee. Where the limit is from EUR 1,500,001 - from 0.1 %. Tax invoices and reports are provided in Swedbank Online Banking System for Business free of charge during 2 months after the date of generation of the invoice/report.